Recently powder coated in gloss black. Recently restored . Shipping quote seems high contact at time of purchase. Russell Lee Woodard for Woodard Co. Chair: 34" wide x 28" deep x 27.5" tall Ottoman: 20.5" wide x 20.5" deep x 14" tall. 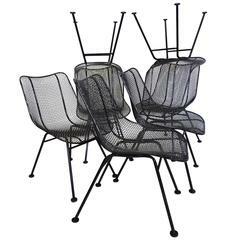 Set of 12 Russell Woodard dining chairs .These are correct dining height chairs not the low height version. Recently powder coated in gloss black with all new glides added. The set recently powder coated in forest green. Table has pine bough detail in each corner takes a glass top not included for shipping reasons. Table measures 24.5 square by 24.5 tall. Vintage round outdoor/patio side table with iron scrolling base and steel mesh top by the Woodward Company. The table can be repainted in your choice of color. 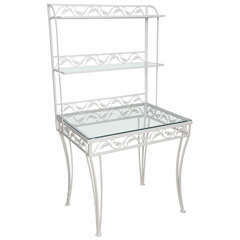 White painted Mid-Century wrought iron étagère/server with three shelves. The largest shelf is 24 in. deep and the other two are both 10 ins. Set of four Woodard wrought iron chairs, classic contoured diamond mesh surface, barrel seat back with hallmark &quot;Chantilly Rose&quot; pattern.